An impressive and aptly named solution for sharing photo streams called Shared Photo Streams arrived on the iPhone with iOS 6 (and a bit earlier on Macs running OS X Mountain Lion). The feature lets you share pictures with other folks and also subscribe to the shared photo streams that they make available to you. Scroll down and tap Photos & Camera. Tap the Shared Photo Streams option so that On is showing. From the view showing thumbnails of all your pictures in the camera roll or another album, tap the Photo Stream icon at the bottom of the screen. Because this is the first time you’ll be creating a photo stream, type a name for it in the name field that appears. If you’ve already created one or more shared photo streams, you’ll have the option to add the picture or pictures you’ve selected to an existing photo stream. To create a new photo stream, tap the New Photo Stream option. Type the e-mail addresses of each person to whom you want to send your photo stream or tap the + button and add names from your contacts. Then tap Next. 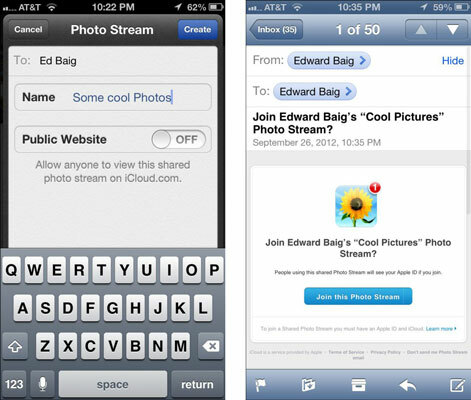 Your friends will get an e-mail inviting them to view the shared photo stream, right. You can share your photo stream with everyone through a public gallery on iCloud.com. To do that, flip the Public Website switch to On (left). If you want, enter a comment. Then tap Post.